Is there an optimal way to tie a knot in space, or to embed a more general submanifold? And is there a natural way to evolve any knot to an optimal equivalent one, so that we could detect whether two knots are really the same? One approach to such questions is to associate to any geometric knot an energy, and look for minimizers or critical points of this energy. If the energy is infinite for immersions which are not embeddings, then presumably its gradient flow will prevent self-crossings and preserve knot type. One way to get an energy with such an infinite barrier against self-crossings is to think of spreading charge along the knot and then consider the electrostatic potential. Such an energy for knots was introduced by Ohara and studied by Freedman, He and Wang, who proved it was invariant under conformal (Möbius) transformations of the ambient space. The gradient flow of this knot energy appears to lead to optimal embeddings, both theoretically and computationally. In particular, for classical knots and links, in work with Kusner, we have used this energy to create an effective algorithm, implemented in Brakke's evolver , to untangle complicated curves to a simple representative for their knot type by gradient descent. In most cases, we reach the energy minimum. For instance, all unknots we have tried evolve to the round circle, and both curves in the famous Perko pair evolve to the same configuration, proving they are the same knot. Thus in most cases, this is an effective algorithm for classifying knots. However, we have also found certain links with several distinct local minima at different energy values; for these rare cases, gradient descent methods will not always reach the same final configuration. We also computed and tabulated energy minimizers for all knots and links up through eight crossings. Knot energies for curves were introduced into mathematics motivated by physical considerations; they are closely related to classically defined energies for divergence-free vector fields which arise in modeling incompressible fluid flow. 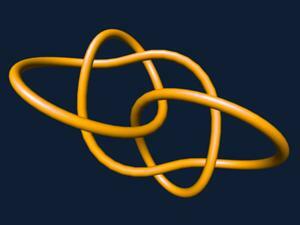 These new knot energies may help to model certain natural phenomena. For example, the inverse power laws in knot energies seem related to some of the energies involved in arising in protein folding problems. And recent experiments suggest that the speed of DNA knots in electrophoresis gels is correlated to other notions of knot energy. This video illustrates these results. We include an animation of a complicated unknot untangling, and pictures of minimizers for other small knots, including some with surprising symmetry-breaking. The Möbius invariance is illustrated with a tour through the conformal group, giving different pictures for the minimizing trefoil. Two standard presentations of the Borromean rings are also shown to be Möbius equivalent. The knots in the Perko pair evolve to configurations that differ only by a Möbius transformation.